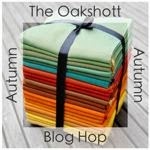 Today is day five in the Oakshott Autumn Blog Hop. On each of the seven days of the schedule (see below) we have one of seven talented quilt-bloggers showcasing projects using the new Autumn fat eighth packs from Oakshott. Grab the button below and follow along the seven stops along the blog hop to find lots of new ideas and inspiration for what to make with these beautiful fabrics. Today it is the turn of Nicholas Ball from quiltsfromtheattic.wordpress.com so hop on over to his blog to see what he has made. I'm enjoying this hop and the quilts so far are gorgeous!